I am aware that Romeo and Juliet is a tale of woe, but that does not excuse the 2013 Broadway production from being so woeful. Apart from one performance this production is shockingly bad, appealing to tweens all thrilled with the flattest, dullest Romeo to strike the Great White Way. The conceit of this version is that the Capulets are black and the Montagues are white. How having a black Prince of Verona does not affect his relationship with the Capulet/Montague feud given how they opted to make race an issue we know not. 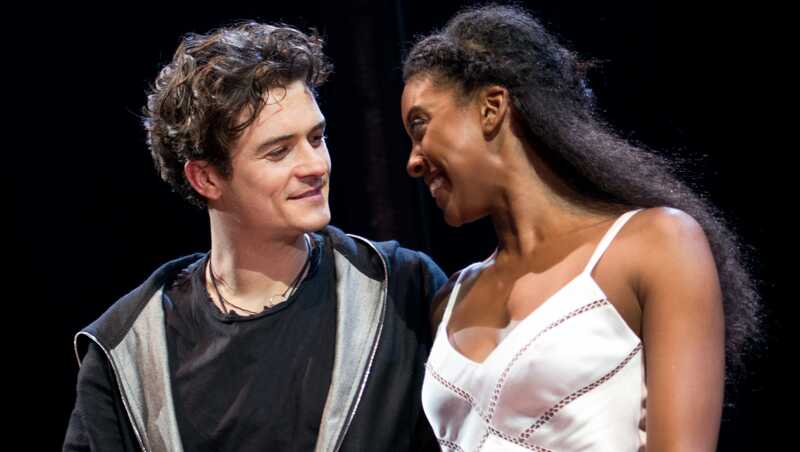 Romeo Montague (Orlando Bloom) falls passionately in love with Juliet Capulet (Condola Rashad), and she reciprocates. The problem is that their families are in a blood feud. Despite this, they opt to secretly marry with the help of Juliet's Nurse (Jayne Houdyshell) and Friar Laurence (Brent Carver), the latter in the hopes that their union will end the bitter feud. However, things cannot be as such, as Juliet's cousin Tybalt (Corey Hawkins) fights with Romeo's best friend Mercutio (Christian Camargo), Romeo's efforts to stop this lead to Mercutio's death, then Romeo kills Tybalt in anger. From there, cascades our cycle of sadness on both these noble houses. You know the target audience of Romeo and Juliet straight from Romeo's entrance. Channeling a bad James Dean impersonator trying to do Shakespeare, Orlando Bloom rides atop a motorcycle in this 'contemporary' version. When he removes his helmet to reveal the ethereal beauty that is Bloom, you could hear cheers and I think squeals of delight from teen girls, aroused at seeing Legolas so close. It's a curious thing in a production when you see pretty quickly that this is going to be a disaster. I saw it from the moment we heard the rumble of the bike. I figure director David Leveaux wanted us to think of Romeo as this classically cool figure, smooth and charming, even hip. His entrance, however, ended up making it look like Romeo and Juliet had slipped into Grease 2, with everyone about to start singing Who's That Guy. I happen to like Grease 2, a guilty pleasure I admit, but it's sad when something as bad as Grease 2 is actually on a higher level than Romeo and Juliet. I'm not such a purist that I cannot have a contemporary production of Shakespeare, but there has to be a reason for it. There was no reason for it, apart from appealing to Bloom's squealing groupies. Oddly, I have always thought that Bloom is competent only in period and fantasy films, floundering whenever he tries to play contemporary. Note I said 'competent', not 'good', because Romeo and Juliet showcase just what a lack of acting talent he has, with nothing to recommend a career apart from his beauty. His Romeo is an embarrassment, good only for spoofing. Bloom has a really amusing tic in Romeo and Juliet: thrusting his right arm out in many of his line readings. I did not keep count, but that might make for a good drinking game: a shot every time Bloom thrust his arm out to show he is ACTING. That, however, is the least of his theatrical sins. Bloom's 'call to arms' is part of a larger issue: how he is not the character but the star. He constantly performs to the audience, as if the other actors were not actually there, not even Juliet. Bloom's performance appears to come from a mind that think they are all props for his one-man show. In many scenes, he is speaking directly to the audience and seems to barely recognize his other actors. Add to that his line reading is hilariously bad. In the Balcony Scene, his declarations of love sound as if he were stoned. As he pushes through "It is The East...", he makes this not the romanticizing of the fair Juliet, but pretty much a declarative statement, with no sense of love or passion. His only bright spot, it appears, is in his Obligatory Shirtless Scene. I wish I could say that his cast pushed Bloom to at least try to up his game, but it looks like they were all trying to act as badly to keep up with him. 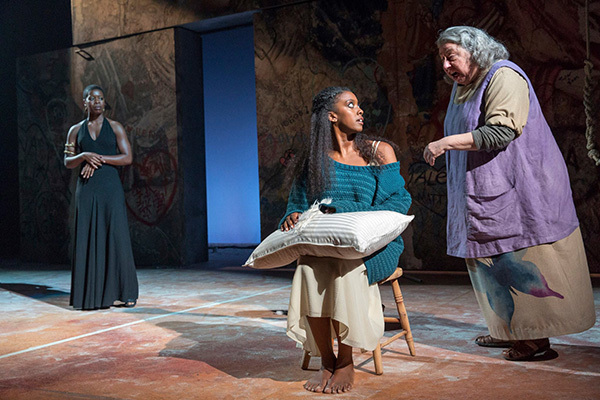 Rashad was slightly better as Juliet, but she came across as insipid instead of love-struck. She also seemed to be rushing through her dialogue, almost in an effort to get this over with the faster. In my notes, the only complimentary thing I could say about Rashad as Juliet is 'she plays dead very well'. 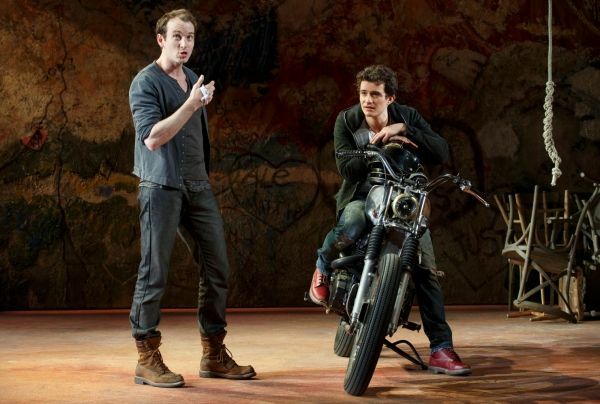 Hawkins was overdoing things as the angry Tybalt and Camargo never got the humor of Mercutio. Houdyshell didn't make the Nurse into the salty character I remember from Romeo and Juliet, but more of a scold to where I wondered why Juliet would think of her as a confidante. The only bright spot was Chuck Cooper as Lord Capulet, who brought a bit of whimsy and humor to his interpretation. A massive surprise is finding former American Idol first first-runner up Justin Guarini as Prince Paris. Even more astounding is that Guarini in his small role actually manages to out-act almost everyone, even if his Paris came across as an idiot. Again, I'm not saying he did a great job. I'm saying he did a better job than those who have or are alleged to have most experience acting on stage or screen. I put this in part on Leveaux, who could not get his actors to make the characters real. I cut him some slack given he had some poor material to work with in Bloom, but other aspects are inexcusable. "That while Verona by that name is known, there shall be no figure as such rate be set, as that of true and faithful Juliet". "Set" and "Juliet" rhyme, nothing wrong with that. However, for nearly the whole of Romeo and Juliet, the actors emphasize that their lines rhyme. In this case, Rudko put force on 'set' and 'Juliet' to enhance the rhyme, but he wasn't the only one doing it. In fact, I think everyone in Romeo and Juliet did it. It was only in terms of degrees. I find that such a pet peeve when watching any Shakespearean production. Shakespeare's language should sound natural, as if it comes from actual speech and not the force theatricality that many productions are plagued with. It needs to sound real, and in this version, they seem to almost enhance and emphasize how unreal it sounds when spoken. Truthfully, I've seen high school productions that have better acting and directing. I've never wanted these two characters to actually die so much as I did after this monstrous rendition of Romeo and Juliet.